Hello all! Hopefully I will return to my regularly scheduled blogging soon. I have quite a few drafts that are just waiting for some much needed attention. If you live in the Wisconsin/Illinois area I wanted to put a conference on your radar. 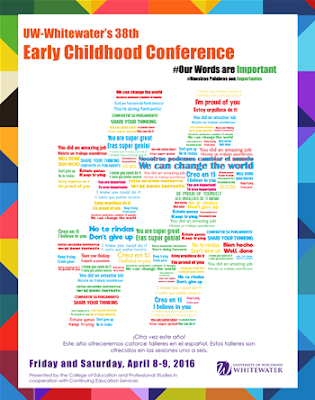 It's a conference dedicated to Early Childhood! It's primarily day care providers who attend this conference, but I went last year and it was amazing. Registration isn't outrageous, and there are some great sessions being offered. You can check out all of the different sessions here, and even find mine. I'll be talking all about programming with babies and toddlers in childcare and library settings. I hope to see some of you there!